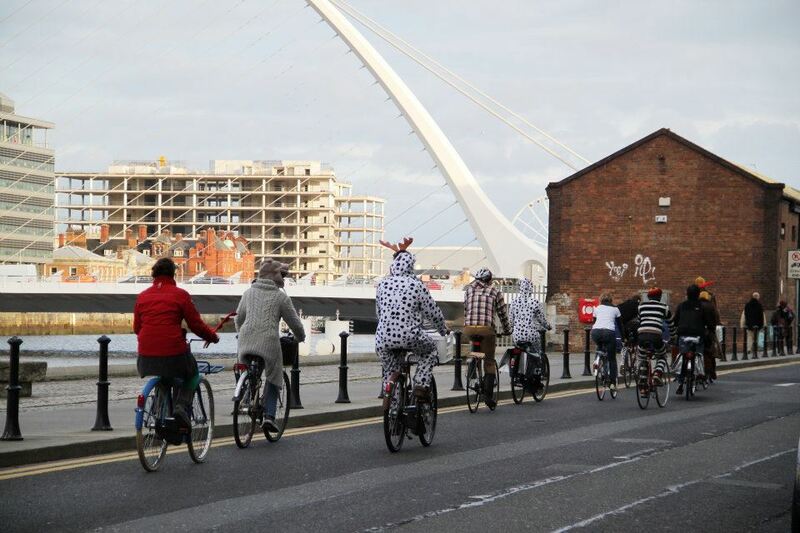 Like I wrote in my last blog post, the Ollie and Lisa from GreenAer hosted a very special cycling tour through Dublin, this weekend. I’m showing the pictures, just to show you I wasn’t exaggerating. Well – what do you think? Something we should do more often? I’m not sure whether all my readers are aware of Movember – the global grass roots charity that aims to promote men’s health by growing a moustache in November. 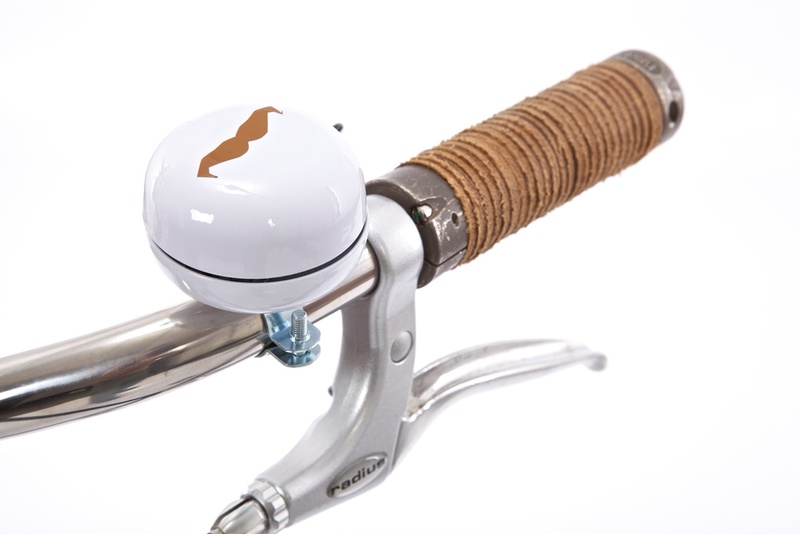 The moustache is called a Mo, and November thus becomes Movember. It’s a cool movement and it has done tremendously well in Ireland. 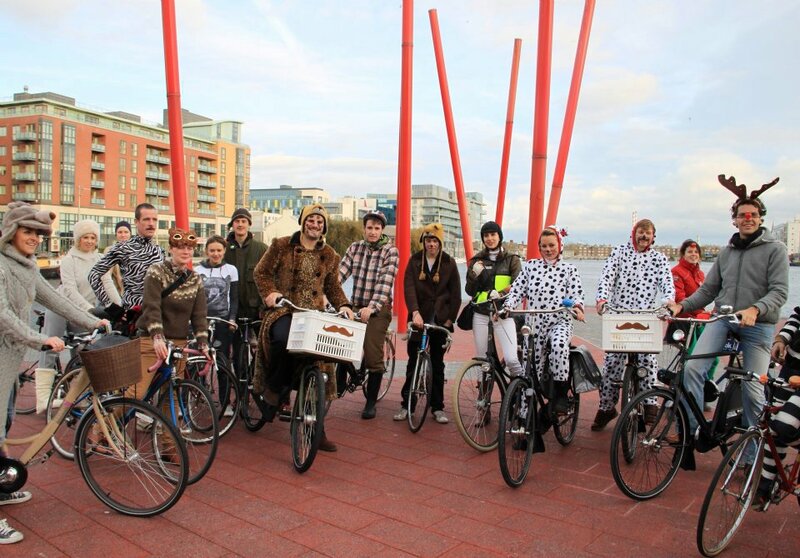 Last year, Movember Ireland raised over EUR 1.6 million. The funds were used, amongst others, to build research centres for prostate cancer in Trinity College. The funds keep several staff employed there full time now. And this is just one of many concrete examples of how Movember has changed the face of men’s health. 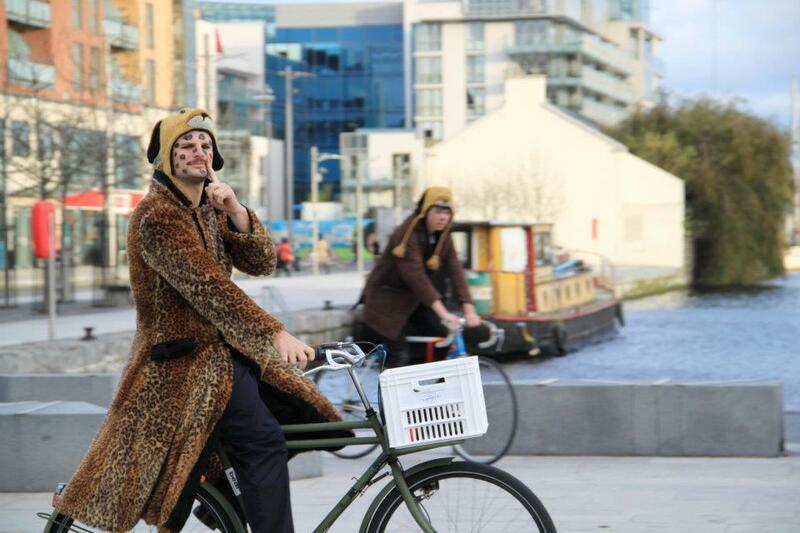 ‘Bike Like a Bear – the Great Movember Outdoors Cycle‘. The event takes place on the 28th of November, starts at GreenAer (12a Magennis Place, just off Pearse St.) at 14.00, and ends in the city centre at 17.00. 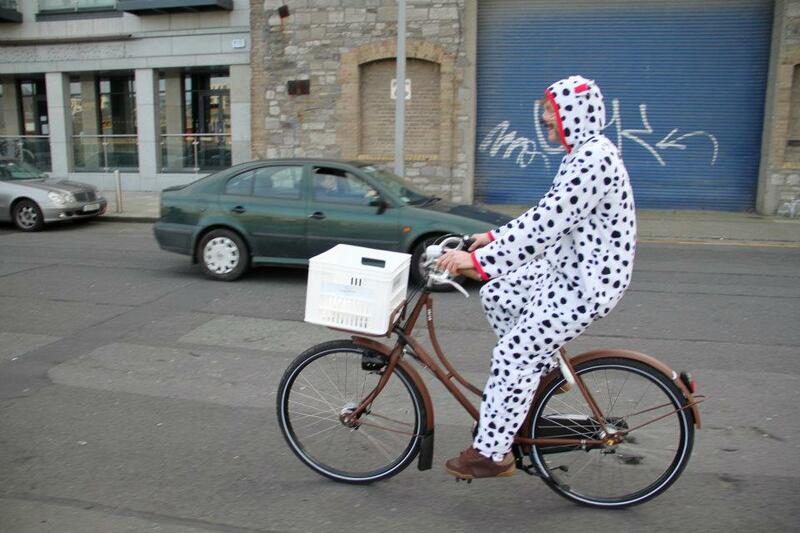 Cyclists with a convincing ‘rugged outfit’ have a chance to win great prizes as well. If you can’t make the cycle tour, feel free to donate to the folks cycling for charity. 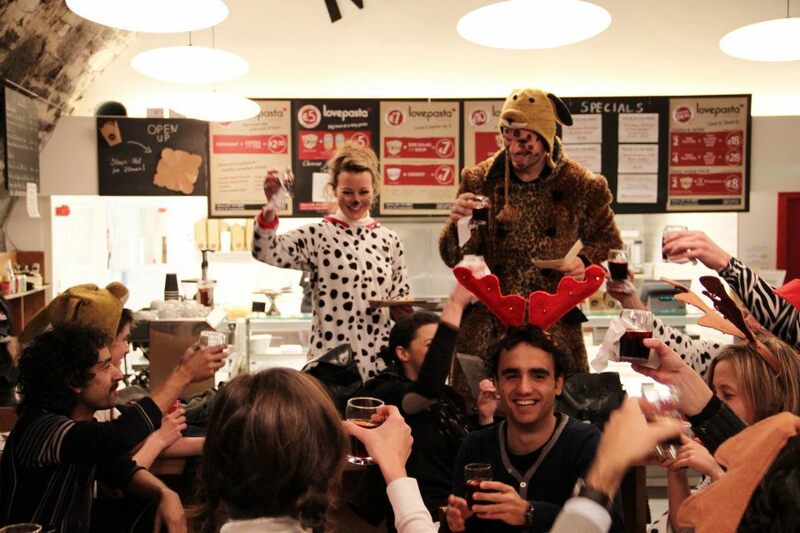 Let’s show the world our appetite for doing good is even bigger this year than last. If we succeed, I imagine the Movember folks might reward us with an even longer period of fundraising in 2012, having us start in October already, growing beards instead of moustaches, calling it Octobeard. Has a ring to it, no? What you see here, is a Chinese bookkeeper presenting an article (the picture was taken by my friends Aude and Willem, who found the book in a Shanghai bookshop and were thrilled to read familiar English, after months of unintelligible Chinese characters). The article explains how significant cycling is for Chinese culture. 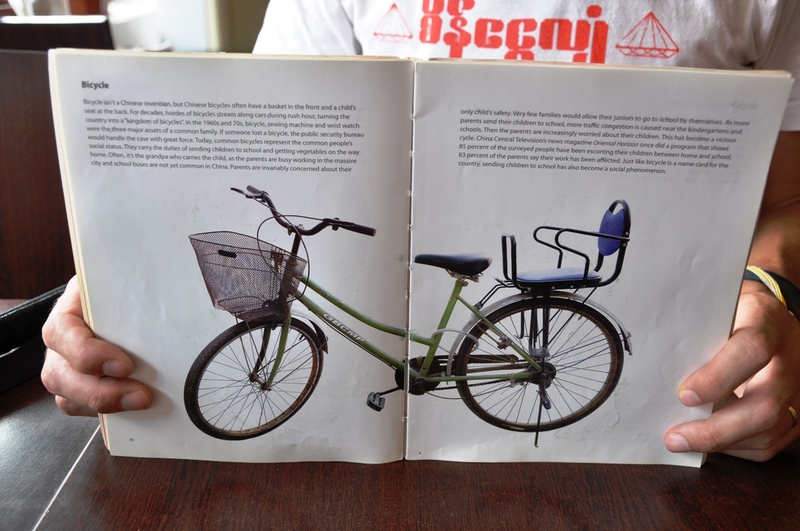 If you zoom in, you should be able to read the article – and learn how back in the 1970s, the bicycle was one of the three most prized possessions of Chinese families (together with: their sowing machine and wrist watch). 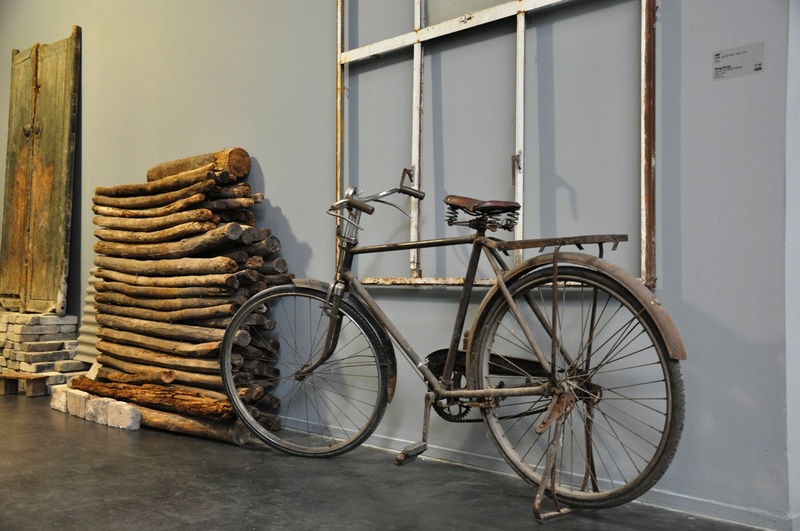 The article states: “If someone lost a bicycle, the public security bureau would handle the case with great force”. I wonder what would happen if the Gardai took a similar approach to bike theft in Dublin. I mean: nobody would want to be on the wrong end of that investigation, right? Of course, China has changed since the 1970s. 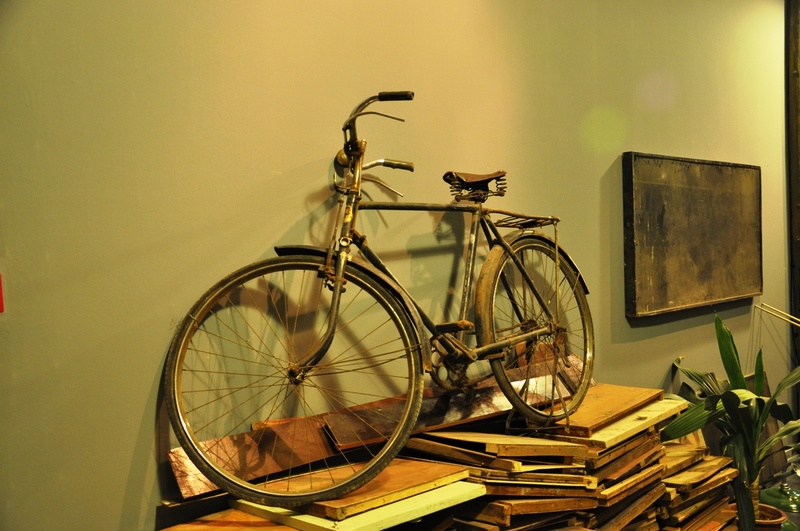 However, that bikes continue to be prized possessions in China can be seen in the 2 pictures below: diamond frame bicycles on display in an upmarket art gallery in Shanghai. I wonder what the Chinese public bureau would do if that one got stolen?